I logged into the Foreman database which is MySQL 5.1 in my case. First, I confirmed the ID is in the referenced table which is ‘puppetclasses’. Then, I tried to manually insert the record into the table ‘environment_classes’. 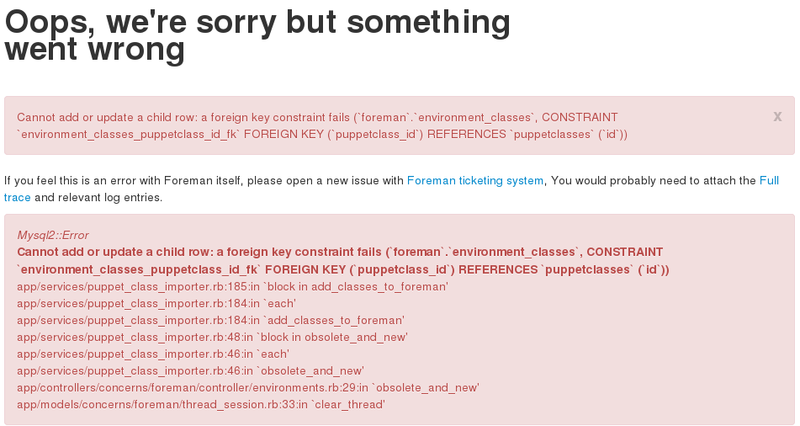 I get the same error, so I can tell the error should have nothing to do with the Foreman front end. Also I noticed that table ‘environment_classes’ use InooDB as the storage engine, the other 3 use MyISAM. Now I guess the issue was caused by the upgrade of the Foreman. It was upgraded to 1.3 couple weeks ago. And my conclusion is the previous version Foreman does not use foreign key, so it works fine with MySQL 5.1. But once upgraded to 1.3, it introduced foreign key into the database. And in MySQL 5.1, only InooDB supports foreign key. So the fix is simple, just change the engine to InnoDB for relevant tables. And there is no outage required. After I implemented the following sql statement, the new Puppet can be imported to Foreman successfully. Oh yeah! !